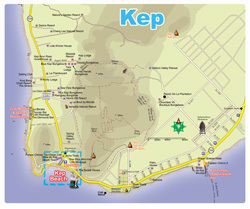 Kep is something of a budding resort area aiming at mid/upper-range guests, and accommodations tend to be bit more expensive than other coastal towns. 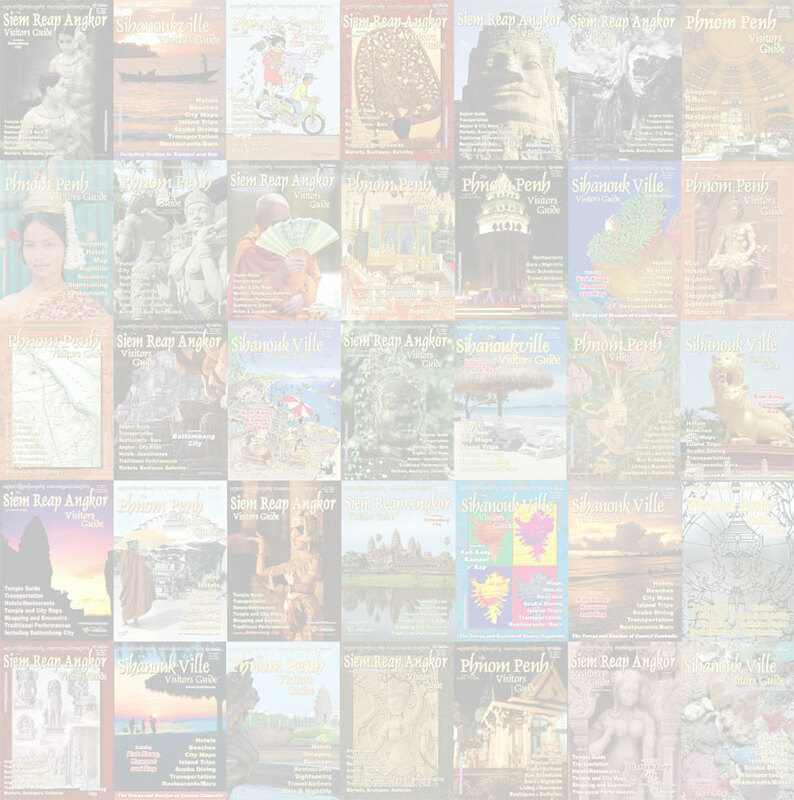 Still, there are plenty of budget priced rooms available, and a growing number of backpacker places, especially in and around Kep town. 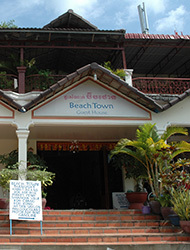 Dozens of hotels and guesthouses are scattered across the peninsula. Along the base of the mountains (east of the Rd 33A) mostly mid-range and upmarket hotels and bungalows sit nestled picturesquely amongst the jungle vegetation, 5-10 minutes from the Crab Market and Kep Beach. 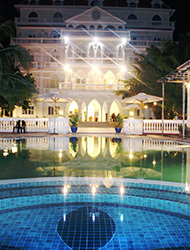 Others, such as the luxurious Knai Bang Chhat and mid-range Beach House dot the ocean’s edge. 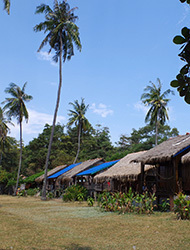 For those on a shoestring, there are a half-dozen budget guesthouses at the Kep Beach intersection and now several traveler/backpacker guesthouses in the Kep Market area and Fisher Village area. 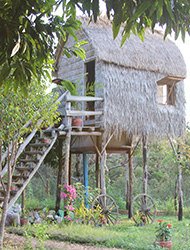 For accommodations on Rabbit Island (Koh Tunsay). 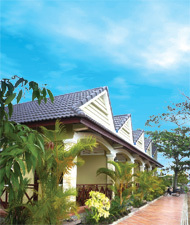 Range: $26 - $70 Located next to Kep national park in attractive tropical gardens with sunset and sea view. 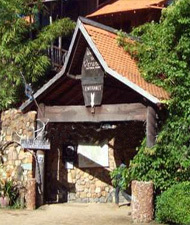 The restaurant serves vegetarian and seafood. 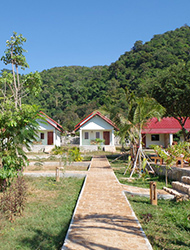 A range of high quality bungalows, with en suite and private porches, A/C, TV and Wifi. Large swimming pool and children's playground. 1km from Kep beach and 10 minutes from Kep crab market. Range: $25 - $60 Brand new hotel offering nicely appointed lower mid-range rooms, a swimming pool and a small lounge bar. 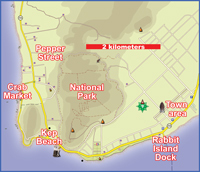 Located a block off the main road between the Kep Beach and town, 100 meters from the Rabbit Island boat dock. 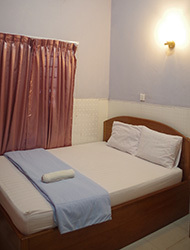 A/c rooms with all new amenities including cable TV, fridge, wifi and en suite bathroom with hot/cold water. 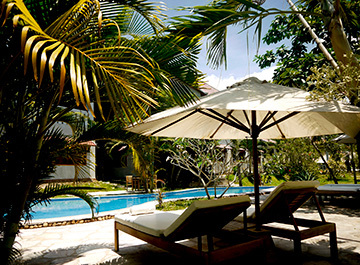 Range: $40 Nestled against the hillside right at Kep Beach, only 20 meters from the water. 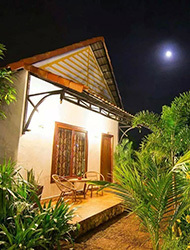 Tastefully decorated rooms with a/c, cable TV, hot water, fridge, en suite bathroom, balcony with picturesque ocean views. Swimming pool and Jacuzzi. Restaurant serving Asian and Western food. Free wifi. 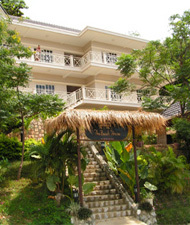 Oceanfront guesthouse overlooking Kep Beach. Clean, affordable fan and a/c rooms with en suite bathroom. Terrace with a beach view. The beach and seafood restaurants 20 meters from the front door. 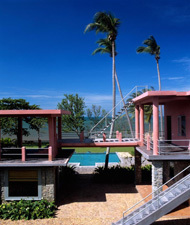 Range: $28 - $55 (Breakfast included) Ocean front bungalows with private balconies and all modern amenities. A/C, Cable TV, stocked mini-bar and free wifi. Wonderful ocean view. Free pick up from bus station. Tour and travel services. Restaurant serving...Tent rental $10-$15. Range: $8 - $20 Basic budget guesthouse very conveniently located next to the bus station at Kep Beach intersection, 20 meters from the beach. Fan and a/c rooms with cable TV and en suite bathroom. 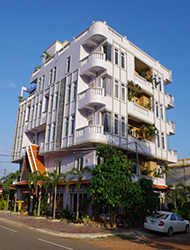 Close to several restaurants, a minimart, tour agents and the beach. 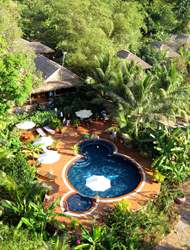 Located next to Kep national park surrounded by jungle hills. Various bungalows & cabins with restaurant/bar area. 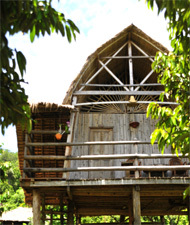 Direct access to jungle trails, spot wildlife from monkeys to great hornbills. Western and Khmer food including fresh Kep crabs and BBQs cooked outdoors on the fire pit. Rustic wood and thatch bungalows in a picturesque garden setting at jungle’s edge, just a few meters from the sand and water. Attached bathroom and private balcony. Nice little restaurant with drinks and good seafood. Massage available on breezy, cushioned massage platforms at the beachside. 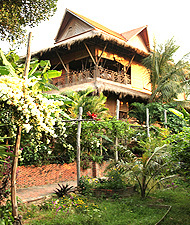 Range: $10 - $22 AA range of traditional bungalows, some with gorgeous views, make up the accommodations in this lush setting, with a school of cultural arts and hospitality, Khmer Hands also works to bring hope and holistic health to disadvantaged and at-risk through education and providing safe and rewarding employment. Informal cooking classes are offered. Range: $10 - $20 Clean, affordable, basic guesthouse at the Kep Beach intersection, the beach a stone’s throw away. Fan and a/c rooms with cable TV, en suite bathroom and free wifi. Convenience store, motorcycles for rent and plenty of crab shacks, restaurants and traveler services nearby. 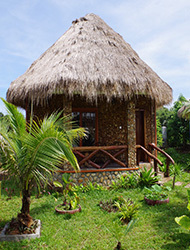 Traditional beach bungalows on Rabbit Island, with or without en suite toilet. Palm trees, beach and a beautiful ocean view. Restaurant servings seafood, Asian, western dishes. family business. Rustic charm set on a jungle backdrop. Thatched bungalows just off from a secluded stretch of beach. 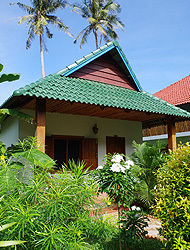 Bungalows are simple in design with en suite toilets. 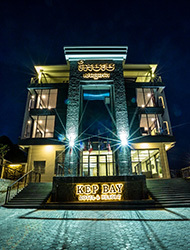 Restaurant and bar is open until 12am and serves both Khmer and Western food. Range: $25 - $60 Conveniently located 100 meters from the Rabbit Island boat dock. All new hotel with nicely-appointed rooms - a/c, cable TV, wifi, large windows, some with balconies and a sweeping ocean or mountain view. Rooftop (5th floor) restaurant and bar with a panoramic view. 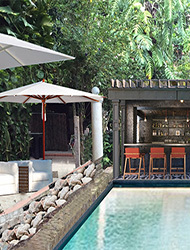 Range: $20 - $100 Palm House has a spacious outdoor swimming pool and poolside bar, along with an in-house restaurant and free Wi-Fi access in all areas. 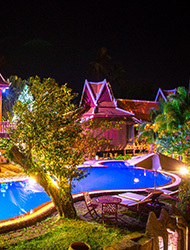 The resorts air conditioned rooms feature traditional Khmer-style décor along with TV with cable channels and a seating area all within a short 5-minute walk from Kep Beach. 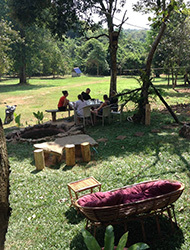 The resort also offers private bicycle tours around Kep. Range: $6 - $8 From the good people at Rusty Keyhole Kampot, rustic bungalows in a garden setting in a quiet area east of town. 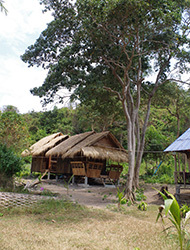 Very basic wood and thatch stilted bungalows with en suite shower/toilet, free wifi, fan and 24h electricity. Best of all is the Kep branch of the Rusty Keyhole restaurant and bar, serving the same great food, sports TV and friendly atmosphere. 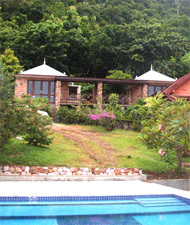 Range: $40 - $65 Large bungalow rooms in a beautifully lush garden setting. 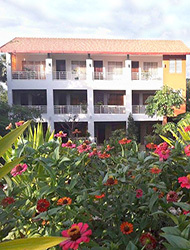 Well-appointed, nicely furnished a/c rooms with CTV, wifi, en-suite bathroom with hot water and a large private balcony. Swimming pool with Jacuzzi and poolside bar. Loft restaurant serving French, western and Khmer dishes. 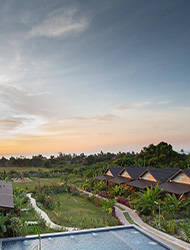 Range: $40 - $100 With an outdoor pool and views of Bokor Mountain, Tropical Hill Kep offers a luxurious retreat a few minute's walk from the Kep Beach and Crab Market. Air-conditioned, satellite TV, garden setting, private butler for some rooms. 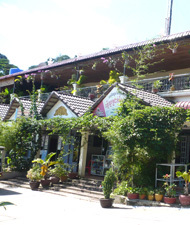 Several hotels and guesthouses are located within easy walking distance of Kep Beach, some right across the street from the beach. 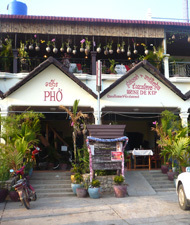 The is a cluster of inexpensive guesthouses at Kep Beach intersection, as well as restaurant and tour agents. There are also hotels at either end of the beach area and up the main road from the beach. Kep Beach is the only accessible sandy beach on the Kep peninsula, but hotels dot the ocean's edge in several nearby areas away from Kep Beach, including a few places on or near the ocean off of Road #33A before the turn off to the Crab Market, in the park area between Kep Beach and town, and near the Koh Tunsay Pier close to Kep town. 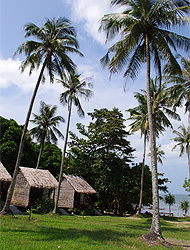 Several of the most interesting and unique accommodations - hotels, guesthouses and bungalows - are located along the edge of Kep National Park and the base of the mountains that rise behind the oceanfront area. 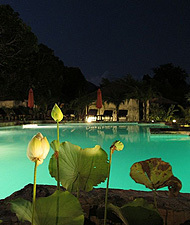 It is a beautiful setting, most set amongst lush tropical vegetation with a jungle mountain backdrop. Many are located a few hundred meters off Road #33A (the approach to the Crab Market/Beach area), and within a few minutes tuk-tuk ride to the Crab Market and beach. 'Pepper Street' - a dirt road stretching off of Road 33A a couple hundred meters from the Crab Market turnoff - is one of the more popular areas, bearing half a dozen secluded hotel and bungalow complexes. Kep town stretches along the ocean side a couple kilometers from Kep Beach, a 5 or 10 minute tuk-tuk ride from the beach and Crab Market. Rabbit Island (Koh Tunsay) is a small tropical island located about 30 minutes south of Kep by local boat. The island is mostly undeveloped except for some rustic bungalows and a couple of beach shack restaurants. Secluded white sand beaches dot the edges of the island. The surrounding waters are relatively clear and warm, offering some snorkeling opportunities around the rocks. 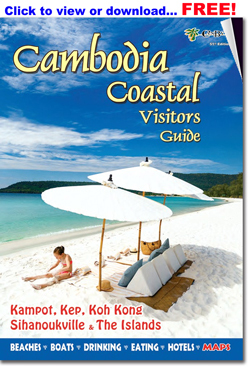 Arrange a boat trip to the island through your guesthouse in Kampot or Kep or just go to the Koh Tunsay Pier in Kep town.